Elliott loves his scooter. He zooms all over the place on that thing. Last weekend he decided it was time he learned to ride a bike. And Jon proudly stepped up to the task. He taught Emma and Ethan to ride. Now our littlest was ready. To me it's not just a picture of Jon teaching Elliott how to ride a bike. 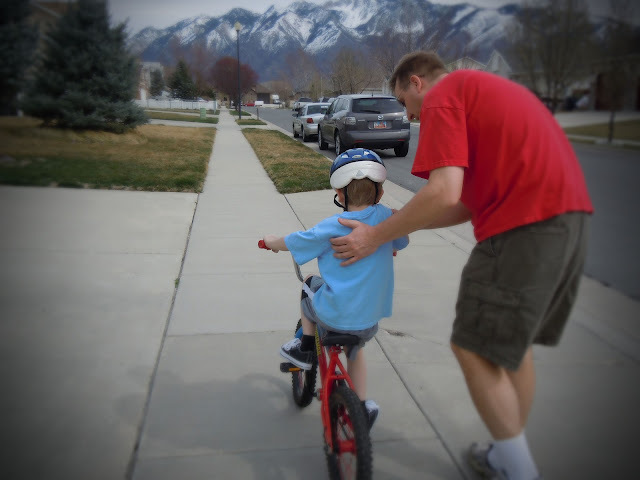 a father guiding and supporting his son - preparing him for what's ahead. As someone who lives in a snow-free climate, it blows my mind that there is snow on the mountains near your home and yet Jon and Elliott are each wearing shorts and a tee! Whenever I see snow I instantly think icy cold - brrrrrr. Clearly I'm a big sook....LOL. This post is so adorable.